Do you want to extract text written on an image file? NewOCR is an online tool for OCR (optical character recognition). It can convert text written on images into editable text. 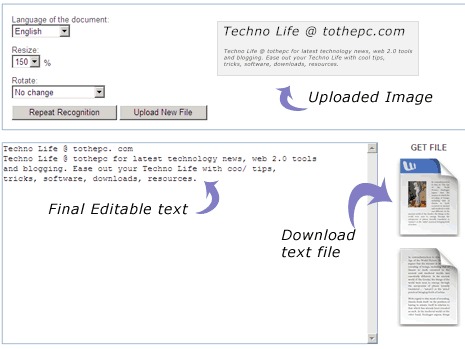 You can copy editable text and save in the form of notepad or word document file. It is an online tool and does not require install, registeration or any software download. 1. Open NewOCR website & click browse, select image on PC. 2. Select language of text on uploaded image from drop down menu. 3.Then click “Send File” button to upload image. 4. It will display editable text extracted from image at the bottom. You can download final text as doc or txt file by clicking buttons on the right side. This online tool support popular image formats like: JPEG, PNG, GIF, BMP and TIFF (upto 1MB file size). For sure one easy and quick way to grab text written on images, what say? While searching for a free online OCR service to text my image documents, i found that most of the online services give roughly the same accuracy given high image quality. I recently used sciweavers.org/free-online-ocr, which provides a good balance between high accuracy and very clean user interface. The service does not imply any restrictions so far, no ads, 33+ langaues, multiple image formats.